George Coles Stebbins (1846-1945) was an American Gospel hymn writer who composed the music for such familiar hymns as "There Is a Green Hill Far Away," "Ye Must Be Born Again," "Take Time To Be Holy," "Have Thine Own Way, Lord!" and "Saved by Grace." George Coles Stebbins. Biographical sketch. 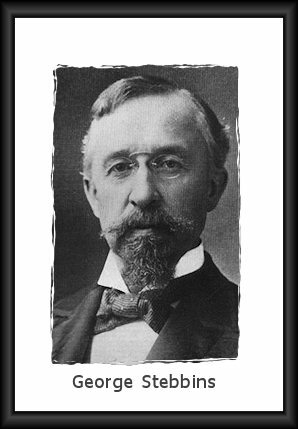 George C. Stebbins: Composer of Some Familiar Hymns. Grave of George C. Stebbins. Maple Grove Cemetery, Kew Gardens, Queens, New York. George Stebbins married Elma Miller (1847-1915) in 1868. They had one son, George Waring (1869-1930).